Tamara Ba'Aretz [Tamara in Israel! ]: The words of my mouth and the meditations of my heart. The words of my mouth and the meditations of my heart. Monday morning was Rosh Chodesh Av, the first day of the Hebrew calendar month of Av. A group called Women of the Wall gathers each Rosh Chodesh to pray together at the Western Wall, the holiest site in the Jewish religion. 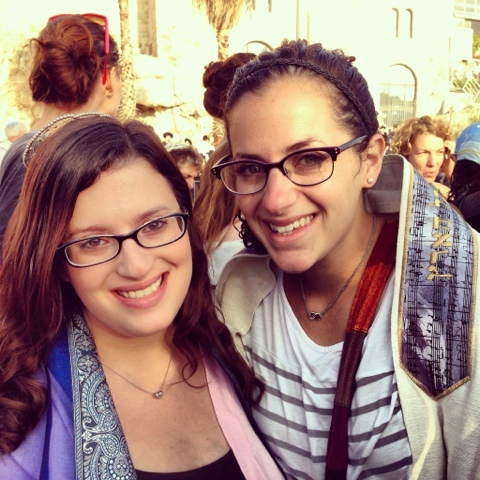 (To learn more about Rosh Chodesh and why Women of the Wall chooses to gather at the Kotel each month: http://womenofthewall.org.il/rosh-chodesh/what-is-rosh-chodesh). 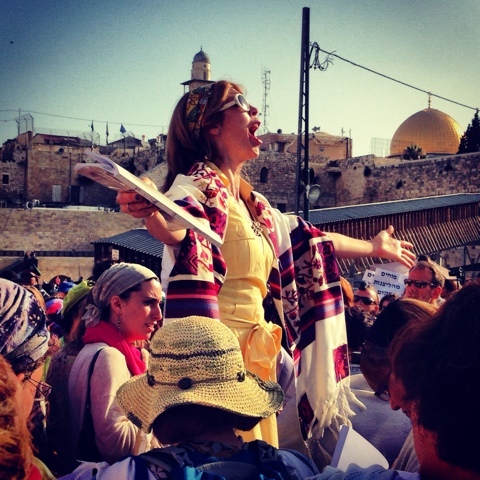 Women of the Wall's mission statement in a nutshell is to exercise our rights as women to pray aloud, to read Torah aloud, and to wear tallitot (prayer shawls) at the Western Wall. Each Rosh Chodesh, hundreds of women (and men who support WOW's mission) recite the Rosh Chodesh Hallel service, which includes wearing tallitot, singing, and reading Torah. Progressive American Jews oftentimes don't realize how lucky we are to be able to participate fully in Jewish life and ritual. Practicing our religion freely is a luxury to which we've grown accustomed. I have been praying, singing, and wearing tallitot for my entire life and haven't thought twice about it. However, the American Jewish reality is drastically different from the Israeli Jewish reality. 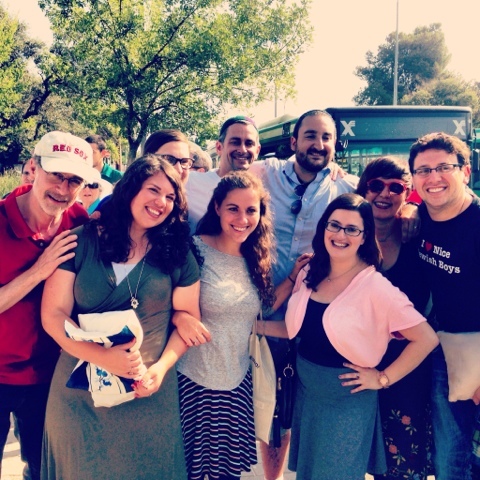 Here in Israel, progressive Jewish groups are a stark minority. There is a Masorti movement here with which I am proud to affiliate, as well as Reform communities and egalitarian minyanim. 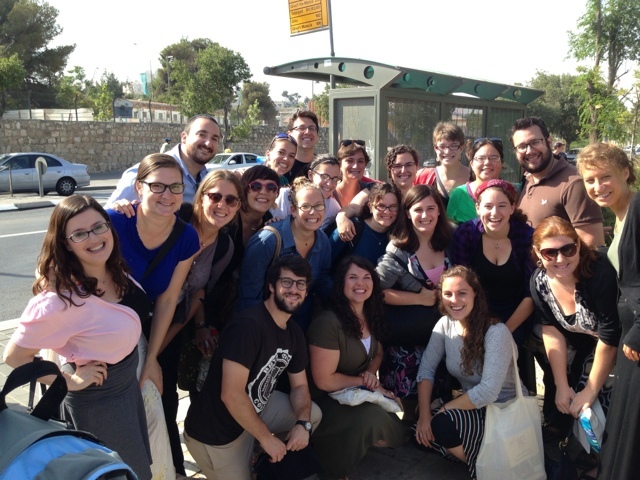 For the most part, however, there is only one Judaism here in Israel that really counts: Orthodox. Of the many tenets of Orthodox Judaism, some of the strictest rules dictate gender roles. One ruling in particular, kol b'isha erva, translates roughly into the concept that the singing voice of a woman is in and of itself a sexual provocation. Thus, Orthodox men are not allowed (unless under very specific and oftentimes uncontrollable circumstances) to hear a woman sing. This prohibition extends to live concert performances, recorded songs, and prayer. That means women can't sing, let alone pray loudly. And they certainly can't wear tallitot, a Jewish practice that Orthodox Jewish law reserves only for men. Basically, our very presence at the Western Wall was extremely problematic for the Orthodox community that showed up by the thousands to protest on Rosh Chodesh morning. They jeered and booed and sang and screamed to try to drown out our prayers. They threw eggs at us. They crowded the Western Wall plaza, pressing up against barricades to shout insults as we passed. I felt perfectly safe -- physically, at least. 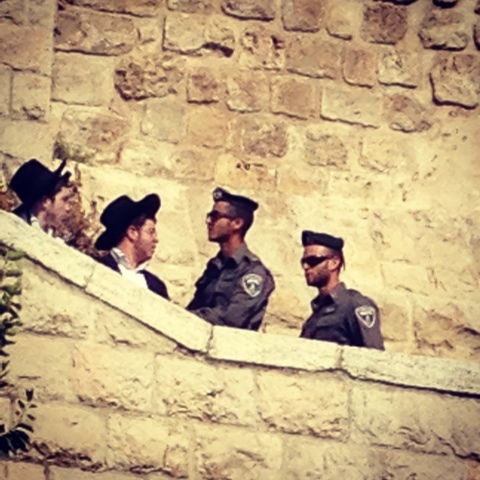 We were escorted and guarded by IDF soldiers and Israeli police officers the entire time. I was surrounded by members of the varied Jewish communities I've been a part of throughout my life: American Jewish University, Hava Nashira, Pardes, and now Hebrew Union College-Jewish Institute of Religion. I knew in my heart that I had nothing to worry about. But I was really truly terrified. The hatred I felt from behind the barricades made me feel vulnerable, invalidated, and deeply sad. The insults infuriated me. How could my fellow Jews live with themselves, waging a war of words on us as we recited the Shema? How could they, in good conscience, boo and jeer at us when we began the Amidah? It seemed to me the most un-Jewish thing they could possibly do. All I wanted was to pray. All I wanted was to celebrate the new month surrounded by the people that add significance and meaning to my life every day. All I wanted was to exercise my right to speak to G-d. The same G-d that each and every human being on this earth confides in and cries to and speaks with every day in synagogues and churches and mosques and meeting houses. One G-d. One humanity. Isn't that what matters? I posted a status on Facebook shortly after I returned home from the Western Wall that morning. Over the next five hours, I watched a heated debate unfold over a series of approximately 80 comments. The comments centered around two Orthodox Jews and multiple Progressive Jews battling back and forth. There were emotions. There were assumptions. There were accusations. There were egos. And there was absolutely no resolution -- not that I ever expected one. But the exchange was a striking microcosm of the bigger philosophical and theological issue that is at the heart of the war between Orthodox and Progressive Jewish communities. I can't even pretend that I've processed all of my thoughts and reactions to Monday morning's events. But I do know concretely that the outpouring of concern and support from the people in my life has been extraordinary. I have received messages from people who are neither Jewish nor political, but who read through all 80 comments and wanted to share their reactions privately. I've had conversations with friends and colleagues that bode well for the future of the Jewish professional world. And despite the discomfort and sadness, I feel hopeful that we will continue working towards meaningful and positive change in our communities, both here and at home.